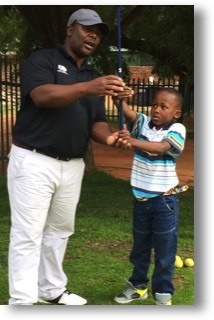 Obed Sholoma giving a golf lesson to Kenny Wilson. Songz Sonamzi giving a golf lesson. American golf photographer, Kenny Wilson was in South Africa enjoying the amazing golf that SA has to offer. 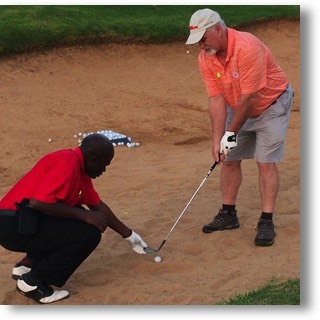 Kenny met Obed Sholoma while staying at the same guest house, SA’s version of a “bed and breakfast.” Obed, a former Zambia national golf champion, traveled to South Africa to be certified as a golf instructor for the people in his country. Obed was sponsored for the trip, because few in Zambia have the luxury to travel long distances. Even though Zambia, the size of Texas, has no golf driving ranges or training facilities, Obed was dedicated to teach people of his country the game of golf. This inspired Kenny to start began researching the need, and it became evident that even if youth and people of poor countries learned the life-skills of golf, they would have no place to play. Therefore, Kenny started a campaign to raise money in the USA, build golf facilities in poor countries, and support people like Obed. Soon after, Obed took Kenny to a PGA Sunshine Tour event at the Soweto Country Club in Johannesburg to follow af PGA Tour pro from Zambia. Clive brought over Songz Sonamzi, a South African born PGA Professional with credentials from both the USA and South America. Kenny shared with Songz the vision then Songz shared his experiences in the USA with Kenny. After an hour of sharing visions, a friendship was born. Songz told Kenny to go over and introduce yourself to the husband and wife who were running the tournament, Dennis & Sharon Bruyns. Kenny and the Bruyns agreed to meet later that week and tell the DiG story. The Bruyns had a similar vision for years, but were too busy to begin the project. They agreed to be on board and helpful in any way!